WASHINGTON (May 25, 2011) -- "No Greater Sacrifice" Freedom Awards were presented May 24 to the former U.S. commander in Iraq and a Ranger who lost his leg from an injury there, but returned to combat duty. Sgt. 1st Class Joseph R. Kapacziewski, who just returned from Afghanistan, and Gen. Raymond T. Odierno were named recipients of the award. The Freedom Award is bestowed annually on those who "epitomize selfless service to the nation and represent the very best of our men and women in uniform," according to NGS founders, Kirk Rostran and Pete Bilden. 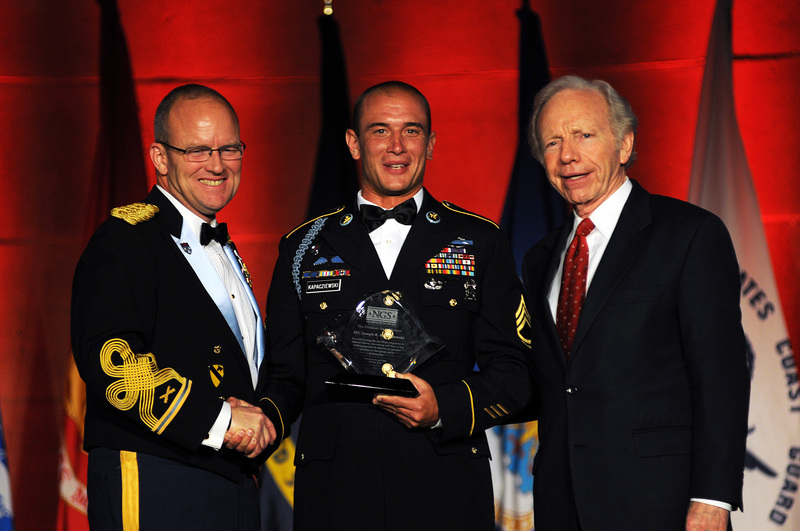 Col. David Sutherland and Sen. Joseph Lieberman present Sgt. Joe Kapacziewski (center) with the "No Greater Sacrifice" Freedom Award May 24. The two Soldiers were honored during a gala event in Washington, D.C., by donors to the NGS Foundation -- which provides college scholarships to the children of those servicemembers who have fallen in combat. The organization has raised some $3 million to that end, and provided full academic scholarships to 19 children and spouses of fallen servicemembers. Kapacziewski, now part of the 75th Ranger Regiment, was injured in combat in 2005 in Iraq. The six-vehicle convoy Kapacziewski rode in was ambushed, and a grenade fell through the gunner's hatch of his Stryker. Three Rangers were injured by the grenade, including Kapacziewski. "Throughout the firefight, he did all he could to remove his troops from danger, to remove those that were fallen -- putting himself last, and only attending to his own wounds after he was sure all his comrades were accounted for and safe," said Sen. Joseph Lieberman of Connecticut, who presented the awards. Kapacziewski went through 40 surgeries to repair his body. Through it all, he was determined to continue to be a Soldier -- even though his doctors told him he might never walk again. "To Sgt. Kapacziewski that was not a statement of resignation, but a statement of challenge -- that called him to yet another battle to prove that those doctors were wrong," Lieberman said. Comparing Kapacziewski to other wounded Soldier's he's met, the senator said, "they want to get back to their unit, they want to get back to the fight. They want to get back in service to our country." Kapacziewski now continues to serve as an Army Ranger. He recently returned from his ninth rotation in theater -- having supported both Operation Enduring Freedom and Operation Iraqi Freedom. Gen. Raymond T. Odierno, who currently serves as commander of the United States Joint Forces Command, was also named recipient of the NGS Freedom Award. Until September, he served as commander of U.S. Force-Iraq. "Odierno had the ability to inspire not only our troops, but the Iraqi people at a time when many people thought the cause was lost," said Sen. Lindsey Graham, who spoke about the general before he received the award. Graham, an Air Force Reserve judge advocate, had served under Odierno. Despite concerns in the past about the outcome of the conflict in Iraq, Graham said contributions from Odierno turned the tide there. "This war is going to go on for a very long time in some forms," he said. "But let it be said that Iraq and Afghanistan, with patience and determination, will go into the win column." While not in Washington for the event, Gen. David Petraeus, commander, International Security Assistance Force and U.S. Forces Afghanistan, spoke to the crowd via prerecorded message. "The strength of spirit and character that Sgt. Kapacziewski has shown in overcoming his injuries and in returning to full duty with the Ranger Regiment and in leading his men in combat with such distinction is an inspiration to all of us in uniform," Petraeus said. "I consider it the greatest of privileges to have served in the same combat zone with you." The general also had words for his fellow general, Odierno -- the two served together first in the earliest days in Iraq, in 2003. During the surge, Petraeus said, when he was the Multi-National Forces - Iraq commander, Odierno was the Multi-National Corps " Iraq commander. "His leadership of MNC-I was absolutely magnificent, his operational vision was exceptional, his determination was extraordinary, and his drive was legendary," Petraeus said. "It was an enormous privilege to have him as a key member of the team during that pivotal period in Iraq." Odierno assumed Petraeus' position at MNF-I in September 2008. "He continued to make a tremendous impact in the land of the two rivers as the overall commander there for another two years," Petraeus said. In October 2010, Odierno took command of U.S. Joint Forces Command, "shouldering with great skill and vision, the delicate task of transitioning vital capabilities of JFCOM to other organizations to enable the disestablishment of that command," Petraeus said. "In short, General Ray Odierno is an exceptional leader who truly epitomizes the selfless service that the No Greater Sacrifice Freedom Award honors." Odierno himself spoke at the end of the event, saying the award was less about him than about those who enabled him to earn it. "That award is not for me. It for the hundreds of thousands of Soldiers, Sailors, Airmen and Marines who served under my command, who sacrificed much greater than I ever did, who have a love for their country," Odierno said. "They want to bring something better to somebody else, and they have a love for their family."